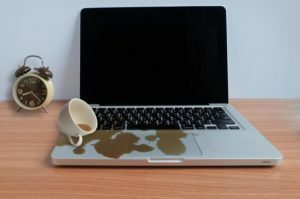 Have you have spilled a full cup of coffee, complete with cream and sugar, on your brand new MacBook Pro? Did your brand new Google Pixel 3 slip out of of your hand and into the toilet? Or did your 3-year old throw your iPad in the kiddie pool? Whatever the case may be, liquid spills can be catastrophic. It only takes a few drops of the wrong liquid to render your device unusable and lead to an expensive repair or replacement. What should you do if this unfortunate situation happens to you? That actually happened to a customer the very day of this writing. A young lady came in to our store and explained that she spilled an entire glass of Captain Morgan and Coke into her keyboard about 48 hours prior, while she was traveling. She had no choice but to wait until she arrived back in West Los Angeles to bring the system in for repair. It is worth stating that the type of liquid you spill is a very important detail. Sugary drinks are worse than plain water. This is because they introduce a sticky component to the liquid which wreaks havoc on keyboards and other internal parts. Clean water, or even black coffee, can be cleaned much more easily. The reason for this is that sugary water is more conductive than regular water. Beer, wine and soft drinks are even more dangerous than a simple drop in a bucket of water. We immediately disassembled the computer and found massive amounts of corrosion. Her system was unfortunately not repairable. If the computer had been brought in immediately, there is a 75% chance we would have been able to save her machine. Since it was not practical to repair her machine (a 2012 MacBook Pro), a new system was recommended from Mac of All Trades, to save her money on a used machine (we are not affiliated with them in any way). If the device turned off because of the liquid spill, don't turn it back on. 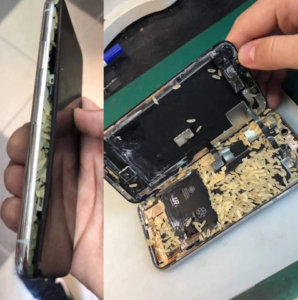 Remove the battery, if you can. If it is a laptop, turn the device upside-down with the screen open. Call your top-rated local computer repair service immediately! Timing is key! The sooner the device can be opened, cleaned and dried, the better. The longer you wait to clean out the liquid, the more likely you will be faced with an expensive repair. But what if it's 2 am? Or what if it is a Sunday, and the repair shops are closed? Or maybe the device is older, and not really worth repairing? Is there anything you can do? Have you ever wondered if the infamous "bag of rice" trick really works? Yes! It really works. Find the biggest bag of rice you can, and bury your device in rice, say a prayer, and hope for the best. I had a Samsung Galaxy S5 that I dropped in the toilet. Yuck! It was thoroughly soaked and immediately turned itself off. I was due for an upgrade anyway, so I thought, "what the hell, I'll try the bag-of-rice trick". I had a 25-pound bag of Jasmine rice in my garage that was stored for years as emergency rations. It was pretty old and about ready for replacement, so it was a perfect fit. I cut open the entire bag, buried my phone into the center of the rice, and went and bought a new phone. With the glory of my larger and sparklingly-new and much faster Samsung Note 7, I almost forgot about the old phone. About a week later I took the phone out, put some soy sauce on it, and it tasted delicious! Just kidding. Actually, I clicked the power button on the phone, expecting the worst, and something amazing happened. The phone was fixed! It turned on and worked perfectly! I was pleasantly stunned. I thought that this trick was just a rumour. I think it helped that I placed my soaked phone into such a large volume of rice. I've known people who failed where I succeeded, but they used small bags of rice, with much less absorption capability. A 25-pound bag of rice is far less expensive than having a computer repaired. Don't skimp on the bag of rice. You can alway rinse it off later and eat it if you are so inclined (don't do that if you dropped it into the toilet though). This technique should also work with bags of other grains like wheat berries, barley, quinoa and more. The rice trick may not work in all situations. And if the wet device has critical data on it, don't even bother with this trick. It is much better to get your machine to your favorite local computer repair shop to have the best chances of a less painful repair. P.S. No rice actually got into my phone. The adjacent photo demonstrates what happens when a customer misinterprets directions.